In this article, we are going to look at two rifle cartridges, the .300 Winchester Magnum and the .300 Winchester Short Magnum. And while their names are similar, we are going to dive deeper into their performance specs in this comparison. The similarities in the name alone are enough to throw off those who might not be familiar with these cartridges. They are used for a lot of the same shooting and hunting applications but these two cartridges are not interchangeable. With this comparison, we want to highlight the differences and the similarities between the .300 Win Mag vs .300 WSM. We are not looking to crown one cartridge as superior to the other. Instead, we want to present an unbiased view of these two cartridges so that you can have a better basis for deciding which one better suits your shooting needs. We will do this by taking a look at several ballistic as well as other performance characteristics of these cartridges. We will also try to tie everything back together at the end of the article to discuss which applications each of these cartridge types might be best suited. The .300 Win Mag takes a 30-cal bullet as does the .300 WSM. This specific cartridge came into production by Winchester in 1963, so this, when compared to other popular hunting cartridges, is fairly new though quite a bit older than the other cartridge we are looking at in this article. This cartridge is easily one of the most, if not the most, popular magnum cartridges in the world when it comes to factory loads. It was by no means the first cartridge designed in the magnum category as the popular 7mm Remington Magnum was released the year prior, but the .300 WM seemed to come out at the right time. And we are sure its performance also had something to do with its decades of success. The .300 Win Mag can be packed with large amounts of powder giving it a huge advantage in velocity. The cartridge is also able to be to take a variety of bullet weights. Most weights are within the 150-200 grain range, but there are several lighter and heavier rounds available. This round is popular for long-range shooters including big game hunters and competitive shooters. The .300 Win Mag has also been used by snipers in special forces and military circles, but the majority of its use is in the hunting world. Like any hunting cartridge, it’s all about matching the style of ammo with the hunting situation when thinking about its effectiveness. The .300 Win Mag cartridges can be loaded with a wide range of bullet weights. These are most often found between 165 to 220 grains but are often found in the heavier range for hunting purposes. The .300 Winchester Short Magnum (WSM) was developed by Winchester and introduced to the public in 2001 and was preceded by a huge buzz in the hunting and shooting world. The concept of short magnum rounds was to provide the power and speed of magnums but allow the cartridges to be used in lighter rifles. The .300 WSM offered shooters, and still does, the power of the popular .300 WM while allowing the user to use a short action rifle that is a little lighter. In theory, short magnums, which have a wider powder column, burn more uniformly and cleanly which should provide more accuracy, though the significance of this can be argued and is not the subject of debate in this particular article. The .300 WSM is one of the more popular short magnum cartridges that have come out in the last two decades. It is used for both big game hunting as well as benchrest target shooting. It has a range of bullet weights from 125 to 200 grains though most would agree that the 150-180 gr bullets often work the best with the cartridge. Just by looking at the bullet and casing specs of these two cartridges we can begin drawing some inferences about how these two cartridges will perform. It also gives us something to look back on when we see the numbers and help us make more sense of them. Both of these cartridges take a 30 cal bullet (.308”) but that’s about where the similarities between these two cartridges end. The WSM has a bit wider neck and wider base than the .300 WM. On the other hand, the .300 WM has a half inch more in its case length and overall length. The increase in length of the .300 WM over the .300 WSM is greater than the increased wideness of the case of the .300 WSM. The difference in how low the bullet sits in the casing is negligible and results in the .300 Win Mag being able to hold a greater amount of powder though the case capacity does not represent how much powder is loaded into each cartridge. The .300 Win Mag also has a higher max pressure though only slightly. Keep this information in mind as we start to look at the actual data comparing these two rounds. To make these comparisons, we have selected ten rounds for comparison with five for each cartridge. There are obviously more options out there but ten felt like a nice round number that wouldn’t make things to cluttered. We also tried our best in selecting a sample that contained some different styles of bullet and bullet weights. The ten rounds we have graphed for this article are listed below. If you already use one of these cartridge types, you might be wondering why we are not using your favorite, and undoubtedly the best, round in this comparison. It’s no sleight, and we have not made the statement that these are the best available rounds available. If it works for you, that should be all that matters. And because we realize that this is a small sample size, we have compiled the numbers for fifteen extra rounds for each cartridge giving us a total of 40 rounds. At the end of several performance and ballistic sections, we have included a table that includes the averages for those forty rounds. By doing this, we hope that it presents you with some more information to base decisions on or just to learn a little more about a particular cartridge that you like. As you will see, with the increased sample size, we still see the trends we see when looking at the ten specific rounds that we will compare and discuss, which should give you some peace of mind that the graphs and discussions that come from them are an accurate representation of how these two cartridges compare and contrast. We will also compile this data in the applications section. All of the selected rounds are factory loads and that are widely available. Factory loads tend to err on the side of caution when it comes to loading the casings with powder. We also want to note that all of the data here is computer generated. The majority of the data is available from the manufacturer, and where that was not available, we relied on ballistic calculators from trusted sources. Where ballistic calculators are used we kept as many variables the same between rounds of the same cartridge. Where calculations are made, we will be sure to make clear our variables. When it comes to this type of data, there is no concern with comparing cartridges, but you should be aware that these numbers can change when being fired from your rifle. Each rifle tends to have its own small differences in its profile, and this means some small differences in the ballistic output. As far as comparing the two cartridges go, computer-generated data has its advantages in that these small differences are negated as well as a lot of environmental factors. So, with all of that out of the way, let’s jump into our comparisons. Looking at the recoil of the .300 Win Mag vs .300 WSM is important for understanding certain situations that you might favor one over the other. It is probably a bigger factor in selecting between one over the other for younger or inexperienced shooters. It’s still something to think about even if you do have a lot of experience. Recoil can influence shots, especially ones where you might not have much time to prep the shot, and it also influences your ability to make follow up shots. We are looking at the energy that is generated when firing these rounds. Don’t confuse that with the “kick” that you feel when shooting. While this energy does translate to felt recoil, it is actually quantifiable. Felt recoil takes a lot of other factors into account that is difficult to put numbers with. We used a ballistic calculator to generate the recoil energy generated from firing these ten rounds (Graph 1). Because propellant loads used by the manufacturer are not available, we went conservative with the loads using Nosler load data and kept the charge the same for each round within a cartridge. We should also note that we used the same gun weight for all ten rounds. In reality, most rifles chambered for the .300 WSM are often a little lighter with them having a short action. And by lighter, it’s usually around half a pound to a pound difference in weight. Lighter rifles often mean a little extra recoil energy that is generated so the numbers might be a little higher for the .300 WSM rounds. If we look at the graph, the first thing you should notice is that all ten rounds generate a pretty significant amount of recoil with all over 24ft.lbs of energy. There is a definite difference between the .300 Win Mag and .300 WSM with all of the .300 Win Mag rounds generating over 26ft.lbs of energy with several in the 29-32ft.lb range. The .300 WSM rounds are not too far off staying in the range of 24 to 26ft.lb range. In general, anything over 20ft.lb of recoil is enough to impact shot placement, though that is pretty relative to who is handling the rifle. For inexperienced shooters, both of these cartridges are going to be felt when shooting and can easily cause flinching. 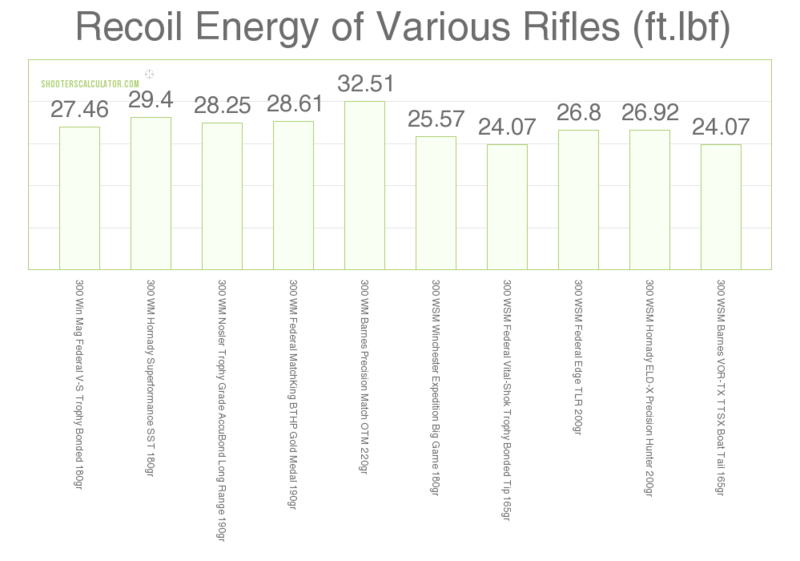 Below we have listed the average recoil energy from all forty rounds we have compiled. When we add the extra rounds into the equation, we still see the general trend for the .300 WM having higher recoil energy than the .300 WSM rounds. The gap between the two is not as wide with the extra rounds and we are only seeing a little over two ft.lb of difference between the averages. Both rounds produce a significant amount of recoil energy and you might see that difference shrink even more if the .300 WSM rounds were to be simulated through a slightly lighter rifle. When comparing two cartridges, the ballistics of each is always an important topic. Knowing how the round performs let’s you understand if it will fit the hunting or shooting situation at hand. In this section, we will look at velocity, trajectory, and ballistic coefficients of the .300 Win Mag vs 30-06 to give us the information necessary to draw some conclusions for when each cartridge is best used. Both of these are .30 caliber rounds and it would be easy to assume that a lot of their ballistic performances are similar. We do have to remember that there are some pretty distinct differences between the two cartridges so it is important to take a close look at as many ballistic categories as we can. We also think that it is important to note that though we are looking at all of these categories individually and that is only giving you part of the picture. All of these categories including the categories outside of ballistics all go hand in hand and influence each other. We will attempt to bring all of this together when we get to the application section. Velocity is an important property of bullets for several reasons. For one, the faster a bullet is traveling, the less effect wind drift and gravity are going to have on the flight path. This is very important for long-range shots, which these cartridges are often used for. Once a bullet falls to a certain velocity, a lot of outside factors can greatly decrease the accuracy. Velocity is also important when it comes to stopping power. Most bullets designed for hunting expand on impact to create a more damaging wound and give optimal transfer of force to the surrounding tissue. These bullets need a proper amount of speed to get the correct terminal ballistics. So whether you are hunting or bench rest shooting, velocity is an important characteristic to understand when choosing between two different cartridges. It influences just about every performance spec that is often discussed when looking at different cartridges. We have compiled the velocity data for all ten rounds from the muzzle out to 500 yards and graphed them here (Graph 2). There are several conclusions we can draw from looking at this data. The first is that all of these rounds have tremendous velocities at the muzzle with both cartridges averaging nearly 3,000fps. Even at a distance of 500 yards, all rounds are supersonic with velocities well above 2,000ft.s. From the muzzle out to 200 yards, the .300 WMS has a slight advantage when looking at the averages though the difference is less than 100fps. From the 300 to 500 yards, the .300 Win Mag has a slight advantage, but again, it is less than 100fps. At any range, both of these cartridges perform very similarly. We also do not see the rounds for each cartridge grouping together. All of the ten rounds are interspersed in the graph which means each cartridge has the options for faster and slower rounds. Just looking at the muzzle velocities, we see three rounds that outperform the others with two of them being .300 WSM rounds and one .300 Win Mag round. Below are the averages for all forty rounds that we compiled for this article. As you can see, even with the increase in sample size, the general trend we saw in the small sample size remains the same in regards to how close these two cartridges are in bullet velocity. One aspect that has changed by adding the extra rounds is that the .300 WSM seems to keep its slight advantage over the .300 WM rounds out past the 200 yard mark. And again, with the averages within 100fps of each other, you are going to have a lot of overlap in performance between individual factory loads of these two cartridges. Both of these cartridges have the potential for long range shooting applications, so while we are discussing velocity, we wanted to look at the distance these rounds can travel (approximately) while maintaining supersonic flights. For hunters, these rounds remain well above supersonic speeds at the distances you will be taking shots from, as you can see from the velocity data above. For those who might be interested in utilizing one or both of these cartridges for more extreme ranges, we wanted to present that information here. Understanding this information is crucial because when bullets fall below supersonic speeds, the flight becomes less stable and the bullets become more susceptible to environmental factors. Understanding this allows you to take the necessary steps when calculating shot placement. Both of these cartridges remain in supersonic flight out past the 1200 yard mark. While the .300 WSM has a slightly longer supersonic flight than the .300 WM, on average, it is only by thirty yards. If you look at the individual rounds (data not shown), you will see that the rounds from each cartridge mix thoroughly. If you want a round that is going to remain supersonic, both the .300 WM and the .300 WSM have a number of viable options. The ballistic coefficient is a number that if you spend any time searching and researching different rounds will pop up. There is quite a bit of complexity to the BC and different variations with different interpretations. For the sake of clarity and simplification, we will discuss it in terms that the firearm manufacturers use to describe their ammo’s flight characteristics. The BC is especially important when you are looking at two cartridges that have been designed to take larger game at long range or for extreme range target shooting where the effects of wind become much more prominent. Which is most definitely the case when looking at the .300 WM and .300 WSM cartridges. In the simplest of terms, the ballistic coefficient is a number that is derived from an equation taking into account a variety of bullet flight specs. The higher the ballistic coefficient, the less prone to wind resistance and drag the bullet is. In theory, a bullet with a better ballistic coefficient should be more accurate since it should be easier to stay on target after being fired. 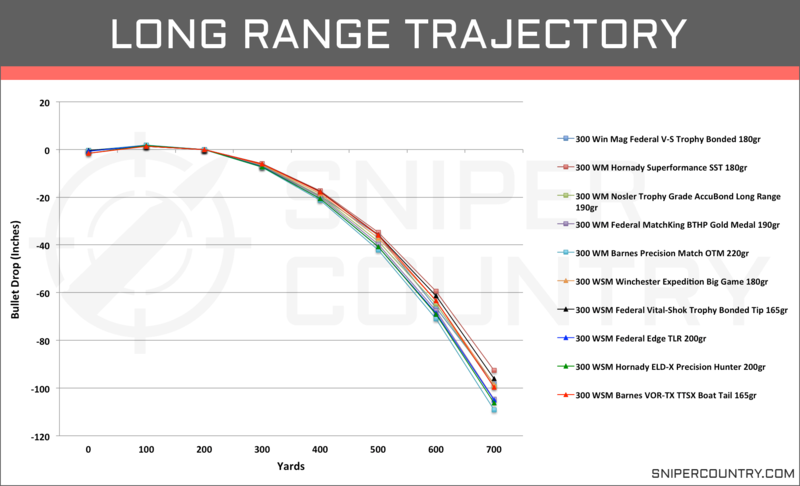 If you’re never going to be taking shots out past 200 yards, the differences in the ballistic coefficients we are about to look at are negligible, but if you’re planning on getting any range on your shots, this should be an interesting section to you. We have compiled each of the ten round’s BC and graphed them here (Graph 3). The first thing that we notice when looking at this graph is that all the rounds from each cartridge have pretty high ballistic coefficients and some from each have excellent ones. If we look at the averages, the .300 Win Mag rounds have a slightly higher BC at .553 while the .300 WSM has an average of .520. Like any category when dealing with cartridges, we are not going to be shooting the averages. If we look at individual rounds, the .300 WSM has two round at .45 and below while the .300 Win Mag only has one that falls below .5. Both cartridges have options with .6+ BCs which are going to be intriguing for the long range guys. And this is only five rounds for each cartridge. We are not under the impression, nor do we want to make the impression, that all rounds available are going to fall within this range. Generally, for factory loads, they are going to hover around these numbers, but if you need a high BC, there are probably rounds of both cartridges available out there and most definitely so when it comes to hand loads. To get a little better idea of how the two compare, let’s look at the averages for our larger sample set. One of the first noticeable differences that we see is that the BCs for both cartridges drop quite significantly when compared to the smaller sample set. Still, for average ballistic coefficients, both have pretty respectable numbers. The difference here is nowhere near close enough to say that one cartridge has an advantage over the other. Both have rounds with very high BCs and both have rounds on the lower end of the scale. Trajectory is one of the most discussed ballistic properties when it comes to discussing the performance between different rounds as well as between two different cartridges. When we talk about trajectory, we are only referring to elevation and how much a bullet will drop as it moves downrange. A bullet’s flight path has a characteristic arc with the bullet dropping in elevation over time. A lot goes into a bullet’s trajectory including bullet specs as well as environmental characteristics. The velocity and BC both affect the trajectory of the bullet as does gravity and wind resistance. Most hunters/marksmen want a flat shooting round. And by flat we mean there is a less pronounced drop in elevation over time. This flatter trajectory makes it easier to adjust for shots over longer ranges and gives you more room for error when trying to quickly judge a targets range. When getting into trajectory with ten different rounds, all with different powder charges and bullet weights it can get pretty cluttered in the discussion. Because of that, we wanted to step back and take a broad look at two rounds, one from each cartridge, that are very similar. They are the same manufacturer, the same bullet design, the same bullet weight, and very similar BCs. If we take a look (Graph 4) it’s difficult to tell if there are even two separate lines. Based on this, we can begin to see that the differences between these two cartridges, when just looking at the skeletal design, is not the determining factor for which cartridge is going to show a more pronounced bullet drop. The bullet design and weight, as well as the powder charge, are what will determine each rounds trajectory. And there are some differences in the cartridge specs as well as the types and weights of bullets more often used for each cartridge. And we shouldn’t head off without also noting that both of these rounds show close to 45 inches of bullet drop at 500 yards, which is not too bad for factory loads that are more suited for hunting rather than extreme range shooting. Let’s take a look at our ten rounds and see how they compare. A lot of people might not think of the .300 WM or WSM when thinking about short range trajectory, but there are going to be shots within 300 yards, especially when hunting. 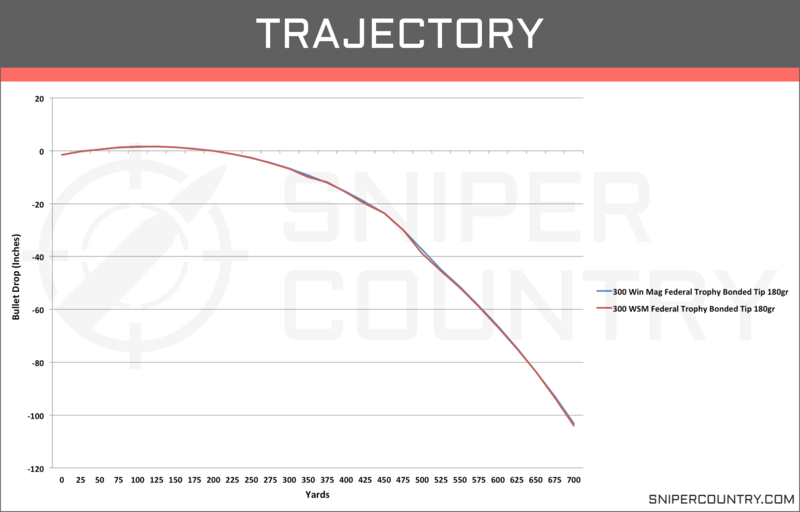 Because of this, we wanted to take a look at the trajectories of these rounds with the rifle zeroed in at 100 yards (Graph 5). 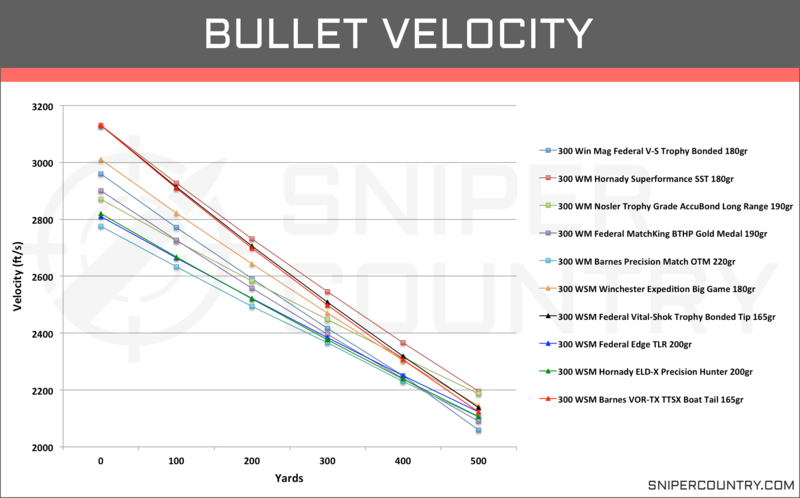 In this graph, we are looking at the bullet drop (inches) at the 200 and 300-yard mark. From this set of rounds, we do not see any pattern regarding rounds from each cartridge grouping together, and we don’t think we would even if we had twenty rounds from each cartridge. At the 200 yard mark, there is .14″ difference between the two averages with the .300 Win Mag having the ever so slight advantage. The flattest .300 WM mag round has a bullet drop of 2.2″ while the flattest .300 WSM round has a bullet drop of 2.6”. At the 300 yard mark, we still see the rounds interspersed, but we do see an increase in the difference between the averages of the two cartridges. The .300 WM has a bullet drop of 9.9 inches while the .300 WSM has an average bullet drop of 11.06″. Still less than two inches. And that change in the difference is mostly due to the.300 WM Trophy bonded ammo from Federal which only has a bullet drop of 6.6”. Which is several inches better than any of the other Win Mag and WSM rounds. It can skew the data a bit but don’t make the mistake of thinking that there are not .300 WSM rounds out there that can give you the same performance. If we look at the rest of the rounds at the 300-yard mark, there is no difference in trajectory between these two cartridges. 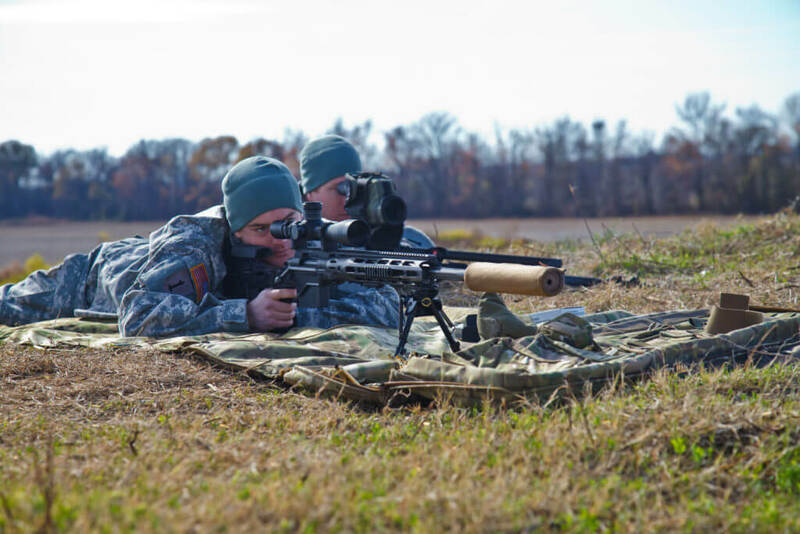 There are flatter and steeper rounds for each and the steepest is only a little over 12″ at 300 yards, which is more than manageable with today’s rifle optics and a little hard-earned experience. In the table below, we have listed the averages of the forty rounds we compiled and their short range trajectory numbers. We have also added in a 400 yard marker for further comparison. Again, even with more cartridges in play, we see the same trend pop up between these two cartridges. From this standpoint of just looking at computer generated data, there is nothing really to discuss between these two cartridges are short range when looking at trajectory. The averages show the .300 Win Mag has around half an inch less of altitude loss at the 300 yard mark but when you look at all of the individual rounds, their distribution make all of them seem like the same cartridge type. If you go out to the 400 yard mark, the .300 WSM rounds have an average of 0.7 inches of bullet loss. From this data, either of these cartridges are going to provide options for flat shooting rounds and probably isn’t the category you will need to focus on until you start trying to decide which round you are actually going to cycle through your rifle. A lot of people who have narrowed down their selection to these two cartridges are probably more interested in how these two compare at longer ranges. So, we gathered the long range data and presented it here (Graph 6). Like the short range trajectory, we measure the bullet drop (inches) out to 700 yards with the rifle zeroed in at 200 yards. Before getting into the specifics, if we just look at the graph, several points of discussion come up. The first is that all ten of these rounds group together very tightly out to 500 yards. 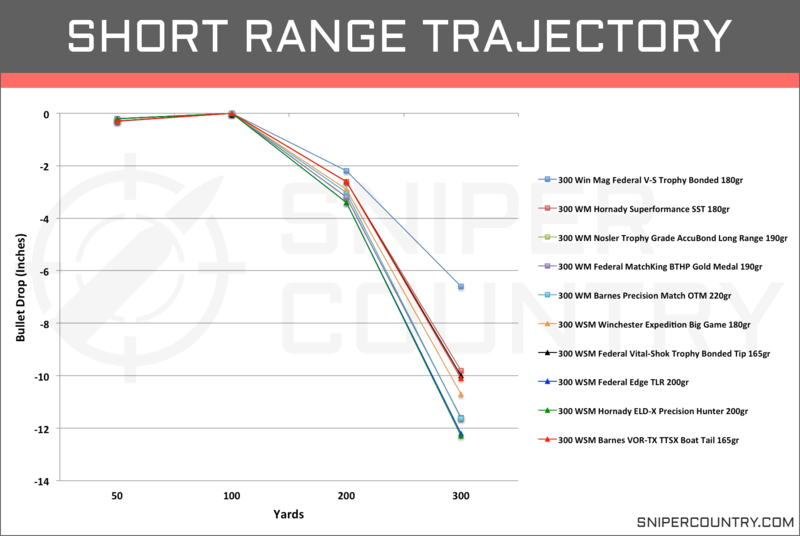 At the 600 and 700 yards, we start to see gaps form between the two rounds, but like the short range trajectory data, there doesn’t seem to be any pattern in how the rounds from each cartridge group together. All of the rounds also show less than 110 inches of bullet drop at 100 yards which is pretty impressive for factory loads, with the majority of them designed for hunting purposes. As far as an advantage for one cartridge over the other, there is never more than an inch of difference between the averages of the two cartridges at any point over the bullet’s range. If you look individually, there are better performing rounds for both cartridges. The two flattest shooting rounds are a .300 WM and a .300 WSM round while the two steepest rounds are also a .300 WM and .300 WSM round. And again, you might look at the numbers on the graph and realize you have seen other trajectory data with much flatter trajectories but remember we are only looking at factory loads. Both of these cartridges can be hand loaded to give better performance specs. In the table below, we have listed the averages of the forty rounds we compiled and their long-range trajectory numbers. We have also a 1,000 yard mark for further comparison. Here again, we do not see any significant difference in bullet drop between these two cartridges at the same yard markers that we looked at above. Interestingly, we do see a little more separation between these two cartridges at the 1,000 yard range. It is still less than 10 inches and when you look at the individual rounds, there are a number of .300 WM mag rounds that show trajectory perform as well or better than the top performing .300 WSM rounds. It does appear that in our selection, there are several more rounds of the .300 WM that have bullet weights in the 190+ bullet weight category than the .300 WSM rounds. Those heavy rounds at 1,000+ yards appear to bring the average down a good bit at this range. And that is usually a tradeoff you get with heavier rounds. The physics just doesn’t allow them to stay as flat while still being manageable in other categories. For hunting purposes, which both of these cartridges are used for, all the ballistic data is important, but if they can’t bring down big and thick hided game, it isn’t going to matter if the bullet gets there. So with that, let’s take a look at the stopping power of these cartridges. In this section, we will examine our ten rounds and look at the kinetic energy they carry along a flight path from the muzzle to 500 yards for our .300 Win Mag vs .300 WSM comparison. We will also examine the sectional densities for each round we have selected to represent both cartridges to determine the amount of potential penetration. Both of these cartridges were designed to be able to reach out at far distances and be able to still carry enough kinetic energy and punching power to kill the target on impact and large targets at that. While both of these cartridges are used at the bench, they are also popular big game hunting cartridges which require a lot of stopping power. This section is probably going to carry more weight for hunters rather than just competition shooters, but it’s never a bad thing to know as much about a cartridge as you can. There is a lot of debate out there as to how we can accurately estimate the stopping power of a round. Some argue that kinetic energy is the most important, some argue for momentum, and some argue that neither give you useful information. We are in the party that all of this points of comparison play a role in stopping power. While we will look at each separate from the others, they should all be taken into account when determining which cartridge would be more advantageous in a certain situation. Now, there are more factors that go into a bullets ability to drop animals cleanly, such as the bullet design and its ability to cause serious wounds based on how the bullet expands when it reaches the target. We can’t quantify this in our .300 Win Mag vs .300 WSM comparison. Because of that, we will strictly focus on energy that the bullet carries and will be transferred to the target and the potential amount of penetration you will get on the target. All bullets, once fired, carry kinetic energy that is generated by the force of the gunpowder being ignited and the weight of the bullet which is basic physics you learned in school. On impact, this kinetic energy is transferred to the target where it causes damage to surrounding tissue and organs. As a general rule, you want at a minimum of 1,000 ft.lb force when trying to take down larger game, and probably more in the 1,500+ range when talking about bear, elk, and moose which these cartridges are often used for. We do think that the amount of energy a bullet is carrying is important to know and understand when using these rounds for hunting purposes, but we also know that those guidelines are arbitrary. Shot placement is equally if not more important than the amount of energy that the bullet is carrying. This sub-category is going to cater more towards those looking for a hunting cartridge, but if you’re going to buy a rifle chambered for one of these cartridges, then there is no harm in understanding as much as you can about each. And given that we are dealing with two cartridges that are known for their incredible knockdown power, this is an important section if your choice is coming down to these two cartridges. We compiled the energy data from the manufacturers of these ten rounds and graphed them below (Graph 7). As we have seen with most of the other categories, there is a lot of similarity between these two cartridges. Though, we do see a little bit more of a distinction between the averages of the two cartridges. Looking only at the averages, the .300 WM hold around a 50-100ft.lb advantage over the .300 WSM from the muzzle out to 500 yards. And while there are better performing rounds than others, there are options in both the .300 Win Mag and .300 WSM that will give you incredible bullet energy through 500 yards. From the muzzle, all of these rounds show bullet energy levels greater than 3,400ft.lb with two of the Win Mag rounds showing greater than 3,700ft.lb of energy. With these two cartridges, we are more interested in the energy once we get out to the 100-300 yard range and beyond. At these ranges, all ten rounds still carry more than 3,000ft.lb of kinetic energy, and all of them maintain this energy fairly well as they move to 200 yards where they all still have well over 2,500ft.lb of energy. From the muzzle out to 200 yards, all of the rounds group pretty tightly together but we do see the two .300 Win Mag rounds show slightly higher energy than the other eight rounds. From 300 to 500 yards, the difference shrinks between those two rounds and the other eight. At 300 yards, all of these rounds still have well above 2,000 ft.lb with several rounds, including both .300 Win Mag and .300 WSM, still carrying more than 2,500ft. lb. At 400 and 500 yards, we start to see the rounds begin to separate from each other. All of them still carry a tremendous amount of energy at these extreme ranges when it comes to hunting though with all of the rounds bringing more than 1,500ft.lb with two rounds still carrying over 2,000ft.lb, one .300 Win Mag and one .300 WSM. Below, we have listed the average bullet kinetic energy for the 20 rounds of each cartridge that we have compiled. While the differences between the two cartridges are the same amount, the slight advantage in kinetic energy has flipped from the .300 WM to the .300 WSM rounds at the muzzle and 100 yards. And this is one of the reasons why we wanted to include the numbers for a larger data set in the event that something like this would happen. Again, there is not really a significant difference and the rounds from each cartridge are interspersed pretty evenly if we were to graph them. And with the formula for kinetic energy and what we know of the velocity between these rounds from the muzzle to 100 yards, we would expect there to be a slight increase in KE for the .300 WSM rounds at these markers. When hunting larger game, you often need your round to be able to penetrate through thick skin and tissue to reach vital organs. One way to determine the amount of penetration two cartridges will have is to compare the sectional density (SD) of the bullets used. The SD is derived from a calculation using the bullet’s diameter and weight. A bullet with a higher sectional density should have greater penetration than a bullet with a lower SD. The sectional density alone does not indicate penetration. The velocity as well as the design of the bullet factor in as well. Higher velocities increase penetration as does highly bonded bullets that will not fragment on impact. Deeper penetration is not always an indicator of a better cartridge. Like everything we have covered, it all depends on what you’re shooting at, and we will discuss this more when we get to the applications of these cartridges. We are not stating here that penetration depends solely on the sectional density of the bullet. As penetration is only a piece of the puzzle for stopping power, the sectional density is only a piece of the larger picture when it comes to penetration. We calculated the sectional density numbers for the ten rounds and listed them in graph form below (Graph 8). From these numbers, we don’t see huge differences between the two cartridge types. Both cartridges have several rounds in the .25 to .3 range though the .300 Win Mag on average has a slightly higher sectional density. While both cartridges use .308” bullets, the .300 Win Mag usually is loaded with heavier bullets than the .300 WSM. In the table below, you will find the sectional density data from the larger data set. From this data set, the .300 Win Mag still has a slightly higher sectional density than the .300 WSM rounds. And again, like most sections we have looked at, there is a lot of overlap in the rounds of both cartridges. In this case, with both of them having the same diameter, it’s just a case of which has more heavier bullets. Again, sectional density is only a part of a much larger equation that goes into stopping power. The momentum of the bullet is another indicator of penetration, and it goes hand in hand with the sectional density and is the topic of the next section. Momentum simply describes the ability of an object in motion to stay in motion. How this translates to bullets and stopping power is the more momentum a bullet has, the more it is going to take to stop the bullet. For hunting large game, you would want more momentum to be able to push through thicker hide and bones which are denser and provide more resistance. For home defense, you don’t need the same amount of momentum. Of course, bullet design (including sectional density) and expansion also influence a rounds ability to penetrate. Sectional density plays a role in momentum as more momentum is conserved when the projectile, a bullet in our case, is striking a smaller area. With a smaller area providing resistance, more momentum is conserved, and the projectile can drive further into the target. We have calculated the bullet momentum by using the bullet’s mass and velocity for each round and graphed them below (Graph 9). Again, like most of the other categories, there is a lot of overlap between the two cartridge types, at least with the rounds we have selected. Both of these cartridges have rounds that leave the muzzle in the 70-80lb/f.s range with the .300 Win Mag rounds having a slight advantage when looking at the averages. The .300 Win Mag rounds have an average of 80.0lb/f.s while the .300 Win Mag has an average of 77.12lb/f.s. The difference between the two averages remains just about constant as the rounds move downrange to the 500-yard mark where the averages for the WM and WSM are 58.2lb/f.s and 22.3lb/f.s respectively. And again, while the averages give a slight advantage to the .300 Win Mag, there are several .300 WSM rounds that provide just as much or more bullet momentum than several of the .300 Win Mag rounds. In the table below, we have listed the average bullet momentum numbers over a 500-yard range for the forty compiled rounds. When we look at the full data set, we see that the .300 Win Mag rounds still have a slight advantage over the .300 WSM, though the difference between the averages has tightened. Is this difference significant in the relation of cartridge to cartridge comparison? Most likely not, but like every other category has gone, there is some variation between individual round. Not just .300 WM to .300 WSM round, but between rounds of the same cartridge type. Anytime you bring up two cartridge types or even two different rounds of the same cartridge, the argument for which is more accurate eventually rears its ugly and opinionated head. There is no doubt, that accuracy is incredibly important. What’s the point of using a round if it can’t be put on target? The issue that we think never gets discussed is that the cartridge itself is only part of the equation when it comes to accuracy. Perhaps more important is how well the ammo cycles through your weapon, which it is the case that some ammo seems to work better with certain rifles than others. And you can never minimize the impact the person holding the rifle has on accuracy. While measuring MOA is a great way of comparing rounds for each person individually, it’s difficult for us to compare cartridges that way for several reasons. The first is that those numbers can change from day to day based on the environmental factors and even the person doing the shooting. And as we mentioned earlier, the rifle being used might give different results than what you are using. And we are not discounting that method of determining accuracy. We just don’t think it’s the best method for looking at two cartridges with a broad view and being able to present you with data that remains consistent. We can look back at some of the other ballistic characteristics we have already examined. That performance can give us some indication of how difficult it might be to place the bullet in the vitals or the bullseye. And of course, this is not taking into account the rifle or the user. We didn’t see any huge difference in velocity from the averages of the cartridges out of the muzzle. Velocity, when paired with the correct barrel twist can make the bullet more stable. So your rifle is going to be a major factor in the velocity of these rounds being a pro or con. Still, a lot of people like high velocity and feel that their rounds perform better with a little extra speed. While the averages were slightly in favor for the .300 Win Mag (around 50 more fps), there were individual rounds, for both the .300 WM and .300 WSM that outperformed the other rounds in muzzle velocity. When we look at the trajectory, we still did not see a lot of difference between these two cartridges. In fact, when we look at the averages of these rounds we see that there was less was never more than an inch difference in bullet drop in the short or long range trajectory data. With that, in this set of ten rounds, the flattest round was a .300 Win Mag round, but we also saw a .300 Win Mag round that was the steepest in bullet drop. Both of these cartridges showed pretty impressive trajectories for factory loads with an average of 6.64″, 19.2″, and 100.9″ at the 300, 400, and 700-yard mark. Besides trajectory, the bullets ability to resist drag and wind resistance is also a factor in helping accuracy. 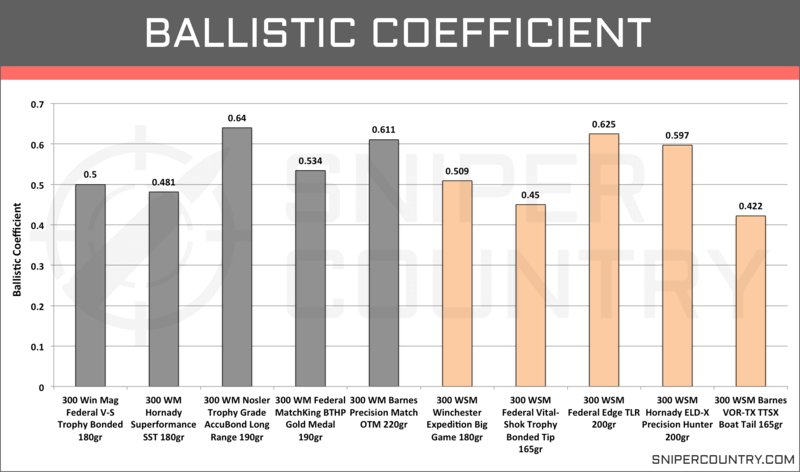 We looked at the ballistic coefficients for all of these rounds and saw that the .300 Win Mag had a slight increase in their average BCs over the .300 WSM. With that, there were several .300 WSM rounds with BCs from .5 to over .6. So, we don’t think one cartridge has an advantage over the other. .300 Win Mag rounds are often a bit heavier than the more popular .300 WSM rounds. This is mainly due to feeding issues with the shorter actions of .300 WSM chambered rifles. If there is no issue with the rifle, there are several 190+ grain weight WSM cartridges out there that give higher BC’s than the 185grain and lighter rounds. Finally, we did see some differences in the recoil energy that is generated between these two cartridges. Both produce enough recoil to influence a shot, especially when you have been shooting for several hours where fatigue can set in and especially if a less experienced marksmen is holding the rifle. There was a trend for more recoil energy with the .300 Win Mag rounds, and we also have to take into account the difference in rifle weights between these two cartridges. 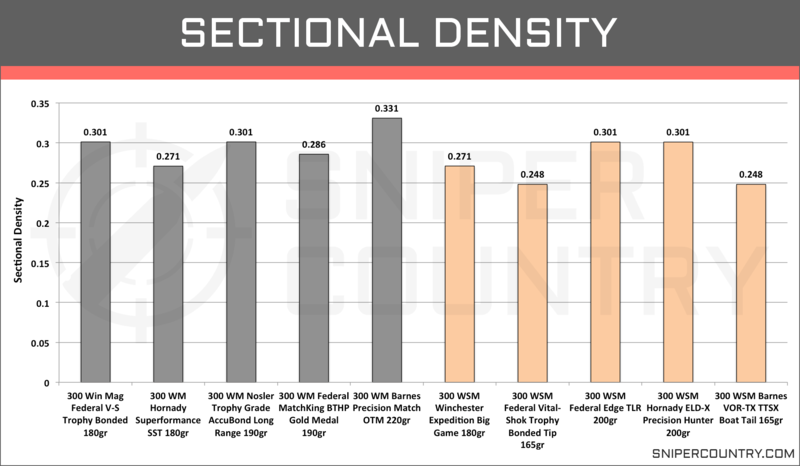 Rifles chambered for the .300 WSM are lighter than rifles chambered for the .300 Win Mag and this reduction in weight often means a bit meaner kick. It’s still relative though, and might not make much of a difference to a lot of you reading this. So while both cartridges have a good amount of recoil, it’s still not something that is going to make you miss a lot of shots once you have put some time in with handling the rifle and the round. And one final issue that we want to bring up is the barrel length. We mentioned that the .300 WSM is often used in shorter, lighter rifles. Some of this reduced weight often comes from using a shorter barrel, and there are a lot of arguments out there for longer barrels increasing the accuracy of the round. Now, it’s not directly correlated such as an extra inch of barrel gives you a certain amount of tighter groupings, but the physics behind a longer barrel and the impact it has on a bullet’s velocity and stability when leaving the barrel implies that accuracy would be positively affected. It’s nothing we can look at with these ten rounds under our criteria, but it’s something we thought you would like to take into consideration and research a little more on your own. While both the .300 Win Mag and the .300 WSM can be found in major retail stores and especially online, there are usually more options for the .300 Win Mag. It is an older round with a much larger following then the WSM and the manufacturers know this. It’s not that you can’t get what you want of the .300 WSM, but you might have to shop around more for it. As far as price goes, it depends on the individual round. If you were to take the price of every round for each cartridge and average it, the .300 Win Mag might be a couple dollars more expensive, but most people are going to be more concerned with the performance of the round. If it gives you the performance, you want a few extra dollars a box is not going to be an issue. Both of these cartridges are a bit more expensive than other centerfire cartridges, but they also bring a lot more to the table regarding stopping power and ballistics. See our above point. Just from looking at these factory rounds, there is no difference in velocity when looking at the averages. The .300 Win Mag rounds do have around an extra 40-50fps at each range marker. How much this extra velocity aids in accuracy isn’t something we can adequately determine in this article. Some people like a little extra velocity out of the muzzle, especially long-range shooters, and there are .300 WM and .300 WSM rounds that give you that. These high-velocity rounds also means a little extra kick. For most people, this recoil is manageable especially given the extra stopping power and trajectory you get from it. Both hunters and target shooters use these two cartridges for long range shots. For factory loads, both of these cartridges bring pretty impressive trajectories. They are not as flat shooting as hand loads, but for those looking to get into one of these cartridges and then move on to handloading, they are going to do well on the range. Both also have round options with very high ballistic coefficients which is always beneficial when you start dealing with higher wind speeds and 500+ yard shots. These characteristics are also advantageous to hunting large game where shots greater than 300 yards are common. Both of these cartridges carry well over 2,000ft.lb of energy at 300 yards with several from both cartridges carrying over 2,500ft.lb. If we take it out to the 400-yard mark, we are still talking about an average right at the 2,000ft.lb mark which exceeds the general limit you need for big North American game. While bullet energy isn’t everything you need for stopping power, it is still an important part, and these numbers should make you feel more comfortable when taking a shot. When it comes to hunting big game, there is one advantage for the .300 Win Mag, and that is the bullet size. These heavier bullets provide more penetration and stopping power that is always appreciated when taking down large game. And as we mentioned before, there are .300 WSM rounds that use the 200-grain bullets, but we have come across a lot of problems that people have when feeding these large bullets through short action rifles. If your particular rifle can handle them, then it’s not an issue at all. 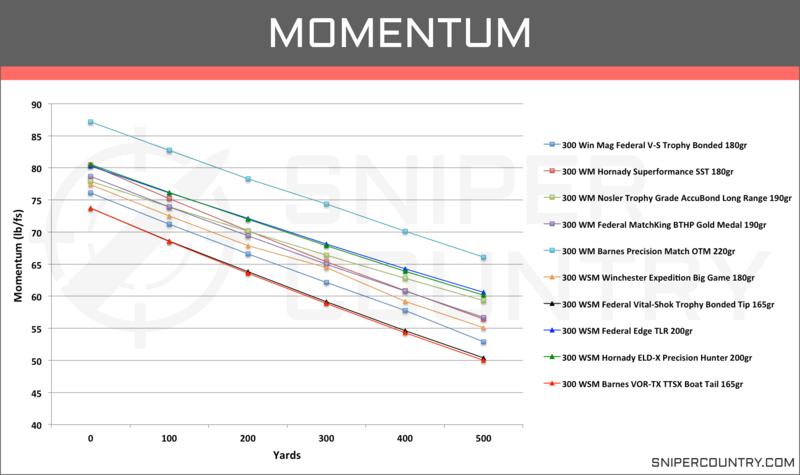 While we saw slight increases in the averages for SD and bullet momentum for the .300 WM, the .300 WSM were not far off at all and there are rounds that provide high performance in both categories. As far as being able to get deep penetration, both of these cartridges are well suited for the job, based on the data presented here. The .300 Win Mag Nosler Trophy Grade, AccuBond Long Range 190gr round, stands out to use from a hunting perspective. For large and even dangerous game this is an excellent round. The Accubond bullet design gives you deep penetration on large game with controlled expansion to provide a lot of damage. Even at 500 yards this round still carries 2,016ft.lbs of energy, so range and stopping power is not an issue even for larger game. It has an incredibly flat trajectory out to 300 yards and is even manageable at the 400-yard range when the adrenaline is pumping with a ballistic coefficient of 0.64. For a large game hunting round, this one has all the characteristics you look for. For big game hunting, the Hornady 200gr Precision Hunter is a great choice. Outside of the bullet design, which is going to provide controlled expansion to deliver penetration as well as deliver the huge amount of kinetic energy this bullet carries, it also carries a ton of momentum. With all of these factors, you are going to get the needed penetration for large and tough game. On top of that, this round has an incredibly flat trajectory at 300 and even 500 yards and a BC of .597 which will make things a bit easier when dealing with less than ideal wind conditions in the field. For the .300 Win Mag, the Hornady Superformance SST 180gr stands out to us as an excellent round to bring to the range. This round offers a decent ballistic coefficient though not as high as some of the others, but it is also one of the least expensive .300 WM we have examined. Even so, it offers the highest velocities and the flattest trajectory than any other round with less than 100 inches of bullet drop at 700 yards which is very impressive for a factory load. If you are on the range, we like the .300 WSM Barnes VOR-TX TTSX 165gr round. 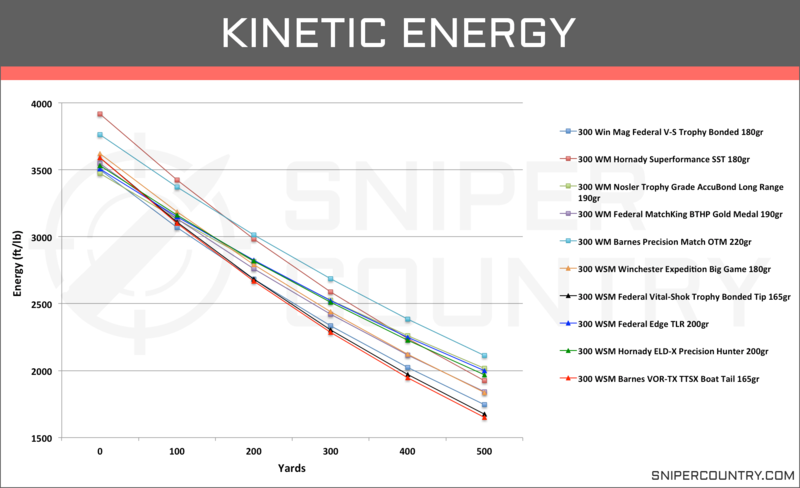 It holds off on the recoil energy just slightly compared to the other rounds but still provides one of the flattest trajectories compared to the other .300 WSM rounds that we have discussed and used in our average tables. This round is also top of the list when it comes to muzzle velocity. It doesn’t have the highest BC compared to the other rounds, but it is still fairly high, and users seem to be very happy with its performance at long ranges. After looking at the data for this sample of rounds from the .300 Win Mag and .300 WSM, we have seen that there is not much difference when looking at the cartridges. You get changes in performance from the individual rounds, but it’s tough for us to say which cartridge gives you more of a certain ballistic or other performance component. The biggest difference between these two cartridges is not the ballistics, but in the rifle platforms they can be used. It’s always good to look into the similarities and differences of two cartridges, but at times, your decision really should be made based on other factors. That just happens to be the case when looking at the .300 Win Mag vs .300 WSM. What it all comes down to between these cartridges from a ballistic/performance standpoint is personal preference, in our opinion. For long range shooting or chasing a bull moose, both of these cartridges, when shot with confidence and skill, are going to put meat in the freezer.